Every type of thermometer for all applications. has been specifically designed to take the guesswork out of monitoring the temperature of chilled foods during storage. Simply insert the s/s probe into the food, push and hold the test button for a short period and the thermometer will indicate whether the temperature is safe. 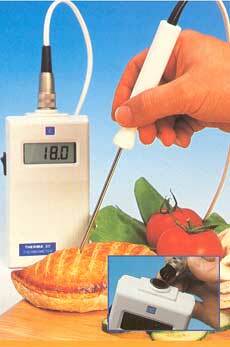 The Therma 20 thermistor thermometer has been specifically designed for use in the food and catering industries with HACCP proceedures in mind. With a large LCD display, it is powered by a 9 volts PP3 battery. The incorporation of a Lumberg connector allows the use of interchangable probes. 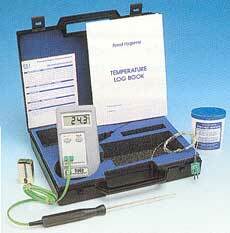 Digital Thermometer Kits - all your safety requirements in one kit. Hand Held Thermistor Probes - one for every application. Anti-bacterial Wipes - tubs of 70, 150, 200 and 500, also in sachets and anti-bacterial spray.